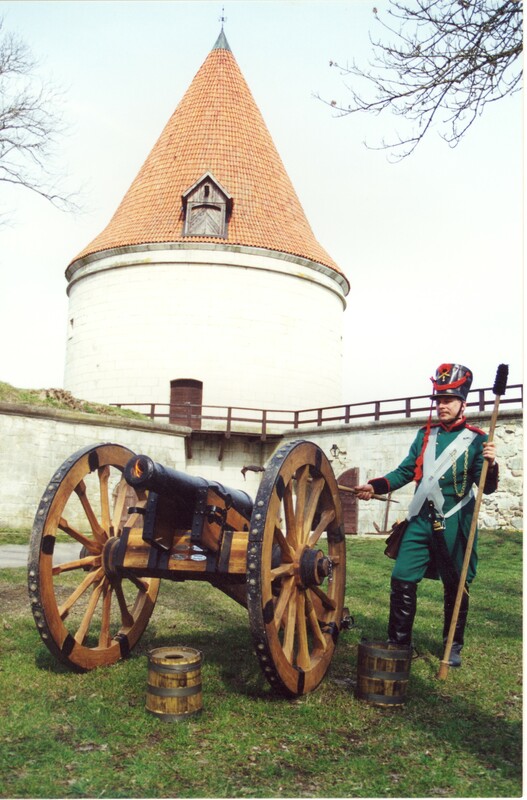 Yes, that is how it really is – a remarkable part of the Estonian total artillery is located in Kuressaare Castle. This is a cannon made in Eskilstuna, Sweden, in 1803. Friedrich Wilhelm von Buxhoeveden (1750-1811), the owner of Vőlla manor, brought it as a trophy of Russian-Sweden war from Finland in 1809. In 1930, two cannons were taken to Kuressaare from Vőlla manor, and these were exhibited in Kuressaare Castle. In about 1990, there was a need to make the historic castle more attractive and to draw public attention to the necessity of restoration of the preserved castle constructions. Class X Furniture, a company from Rakvere, cleaned and preserved the barrel of the cannon and built a new carriage for the historic weapon according to drawings and pictures. The cannon, which was last used by the military of tsarist Russia, was presented after its renovation on 10 September 1999 where it was christened Kotkas, and the servicing artillerist artilleryman Vassili. In the old Livonia, Kuressaare included, cannons were taken into use at the end of the 14th century. During the Danish era, there were 162 different cannons in Kuressaare Castle, but upon their capitulation in 1710, the Swedes transferred 66 cannons to the Russian armed forces. In 1836, the local weaponry was taken to Bomarsund Castle, Ĺland. Once again the cannon was used on the ramparts of the castle in the second half of the 19th century when it notified the townspeople of the arrival of a passenger steamship. Visitors can see the oldest working cannon of Estonia at the entrance of Kuressaare Castle. During the festivities of the town of Kuressaare and Saaremaa Museum, a shot is fired from the cannon. For pleasure of the most honourable guests of Kuressaare Castle the cannon has also saluted. The Danish queen Margrethe II, the Latvian president Vaira Vike-Freiberga, and the Finnish president Tarja Halonen have smelled gunpowder in the yard of the castle. Make an agreement with Saaremaa Museum, and a gunshot and demonstration of the cannon can be ordered for a reasonable price.